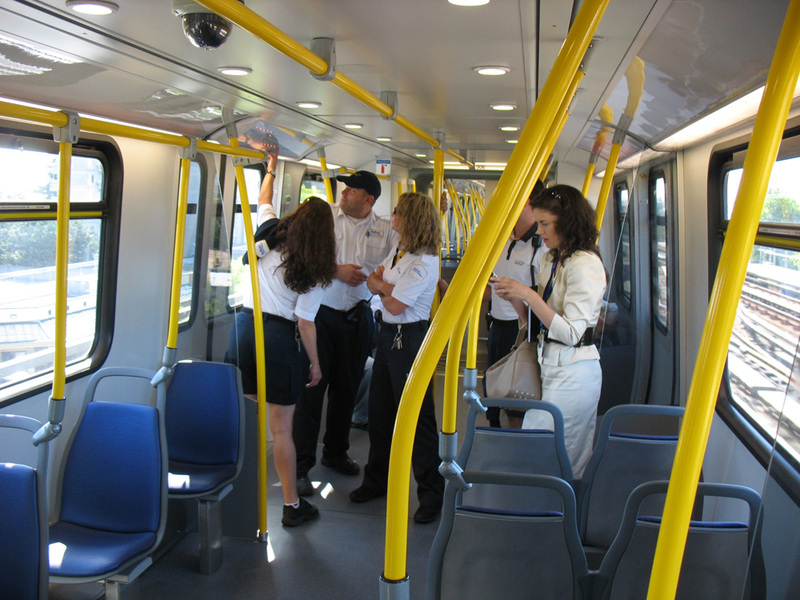 The Buzzer blog » The Buzzer rides the first of the new SkyTrain cars! The Buzzer rides the first of the new SkyTrain cars! As mentioned yesterday, the first of the 48 new SkyTrain cars started running on the system this morning, and I got to jump on for its first trip! The train will definitely be in service for the next week or so, and remember, you’re all welcome on board! It’s currently in an “endurance running” phase, which means it must complete 2000 kilometres of regular service while meeting certain criteria (that’s the equivalent of about one week of service). A critical part of this phase involves passengers boarding and disembarking the trains, so go ahead and get on it! Okay, now above you’ll find a short podcast with some rider reactions to the new car. Just thought I’d capture a few first day thoughts! And after the jump, there’s some more photos and video. I’ll keep it short, since I’m sure you guys will come up with way more great shots and video too — and please do send them my way! 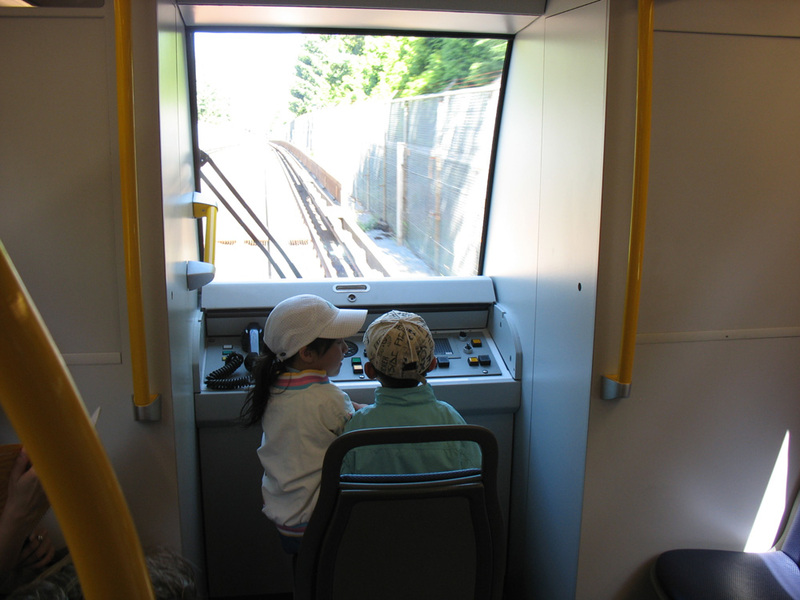 The first junior SkyTrain pilots aboard train #306! In the early part of the ride, the train had more SkyTrain and TransLink people onboard than actual passengers -- the kids above were a few of the lucky riders! These seats on the train fold up to allow room for wheelchairs and strollers. A few SkyTrain attendants took a moment to examine the new maps. A cyclist brought his bike on board! The new configuration allows much more room for bikes. Now here’s a video of the light-up map flashing for the Metrotown stop. Here’s the door lights in operation. Flashing when the doors close! Since a lot of us were TransLink/SkyTrain/media staff, we were allowed to stay on the SkyTrain as it changed direction at Waterfront Station. Here’s the view coming in from the train yard, approaching the eastbound platform. Look at all the people taking pictures! I had to hop off the train at Metrotown and go back to work, but that gave me one last opportunity to capture the new train leaving the station. There’s the LED display on the front, saying King George! The first of the new SkyTrain cars has arrived! As you may have heard in the podcast, I also ran into Bryan from The Transit Site on the train, so watch his site for more photos & video too. The first of the new SkyTrain cars has arrived!! The last of our 48 new SkyTrain cars has arrived! 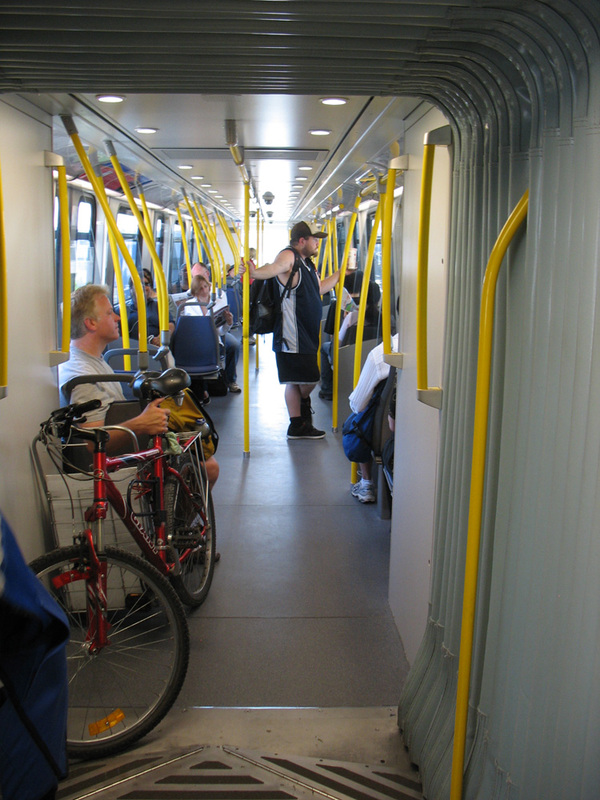 Improved interiors for the new SkyTrain cars! 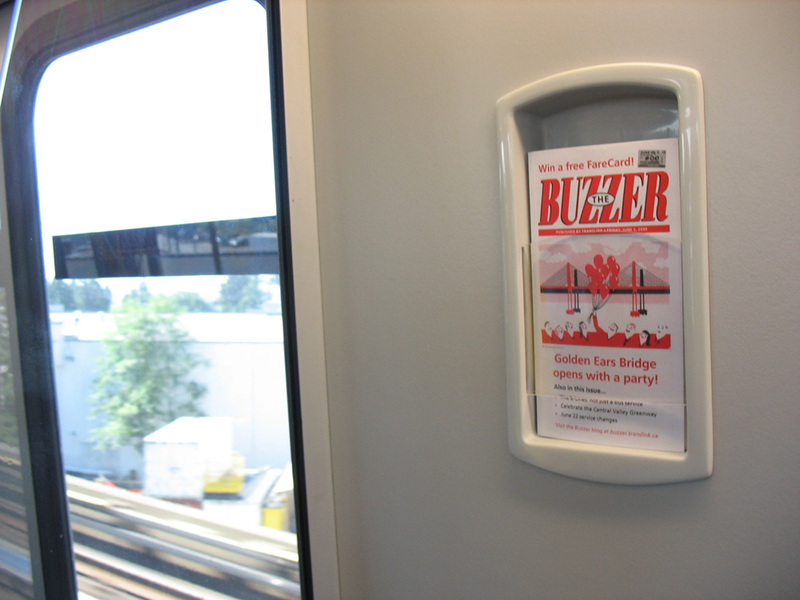 The Buzzer rides the Canada Line! i havent ridden on them yet but ill try to tomorrow if i can catch it! Do you know if the trains will be in service next week during rush hour? I so have to get onto these new trains! Just currious, which way to the lights on the map go? The blinking light is the current station, but are the solid lit stations where you have been or where you are going? I hope the lights are where you are going as that is what everyone’s first guess would be. Josh: Sorry I missed you — say hello next time! Philip: I think my video might be a tad inaccurate. It was taken early on in the journey when the kinks may not have been sorted out yet. As far as I could tell, the lights for the entire pathway of stations (Expo or Millennium) will be lit up, and the only one that should blink is the upcoming station. Donald: as far as I know the trains will be in service next week, which includes rush hour. – the immediately next station coming up on your journey flashes. I think it would be more handy to only have the lights lit for the Stations where the train is going. So that way if I run onto the train at the last second I know exactly where it goes (I don’t care at all where it’s been). It would be a handier guide to others too who might not be familiar with the system and not sure which way the train is even heading. I’ve had to help a lot of people, who knew where they were, but still had no idea where the train was going. What’s the point of the door closing light? It blinks only once the door is already in motion. It’s no warning at all to the hearing impaired. The chime sounds, THEN the door closes and the light blinks. Seems like it is telling people about the obvious. Shouldn’t the light start flashing the instant the chimes start to play, so that the hearing impaired get the same warning everyone else does? Same with the lights on the outside of the train (old ones too), they don’t give people who can’t hear a warning at all, only tell them what they already know by the fact they can see the doors closing. It’s kind of like having an audio/visual fire alarm where the bell sounds when someone pulls the fire alarm in another room, but the light doesn’t flash until the room is filled with smoke or flames. I have to agree with Phillip on the door indicator, though. It doesn’t really give any sort of warning at all, because by the time it starts to flash the doors are already closing. I personally thought that the indicator light would start flashing with the chime. That’s the way it seems to work on other systems that implement door indicators. (That, and usually the door indicator would flash at a faster rate than that on the 2009 MkIIs.) As well, the indicator light doesn’t seem to be in that much of a convenient place. I always thought that it was weird to see the light located in one of the top corners on the door jam. Most RT services usually have a light on each side of the door jam at the bottom, and I know the Canada Line trains all have door indicators above each door on the outside. The destination board is a nice little addition; Something I think should’ve been added with the 2002s since the system went multi-line. I initially thought that someone who had posted about it back when the train was introduced was mistaking the “glow” coming off of the board for the tail light, but I guess I was wrong. Either way, I’m impressed with the new trains. This was a good upgrade that brings the trains on this part of the system up to the same standard as the rolling stock on the Canada Line. As for the door lights, if we had LCD screen, they would have flash, doors open this side (or other side) on the screen! Secondly the door lights should flash prior to arriving at the station so tourists will know ahead of time which side to alight! It’s too late when the doors open, as there’s no point in having a light at the door at that point! I think this new train needs a Twitter account for the next month. Each time the train leaves Waterfront, King George or VCC, a twitter message should go out announcing the start of a run. This way we can get a rough estimate on when to catch the train. Or would this be too much information? The light indicator on the outside sounds exactly like the Canada Line trains. Well LCD Screens would be nice but it’s not really necessary. A lot of the times, transit authorities use those for advertisements anyways. Having said that, the one thing I think our SkyTrains are missing are interior LED signs, like on the Canada Line, that indicate which stations are next, transfer point connections, and bus connections at the upcoming stations. This would really help wayfinding for those who are visually impaired. But then again, the map at least indicates which station is next which is good enough for me. Now I wish the Canada Line trains had a dynamic map. It would be nice for some consistency even though the Canada Line is maintained by InTransitBC instead of TransLink. Hopefully I can take this new SkyTrain soon. Congratulations to TransLink! I have 2 questions. Can the new Mk 2 connect to the `old` Mk 2? and: since the canada line has the same gauge as skytrain, can the skytrain go on the canada line, even if there is no other track? Q1: yes the new and “old” MKII trainsets can be coupled. Q2: The skytrains cannot operate on canada line guideways because there is no induction strip (the aluminum strip between the rails) and the communications system is different. Thanks for the reply, Dain. I have one last question. What are the signs on the side of the box grider mean? There actually is door lights outside of all trains. It’s a red and yellow-orange light. The orange light is on when the door is open. The red light is if in service or not. Can we call this Mk 2.1? How many different variations of Mk 1 have there been? I got to ride the new train today, but i found the low pitched hum incredibly annoying. Overall I thought it was pretty cool, including the little blinking map. There are three Mark I variations: 114 cars (numbered 001-118; there is a gap from 057 to 060) built in 1984-85; 16 cars (121-136) built in 1991; and 20 cars (137-156) built in 1995. Each type has a distinctive front end. Kenneth T: here’s the response from SkyTrain regarding your questions. No, the door lights do not indicate in advance which door will open. There will not be any announcement made to the riding public with respect to which doors will open when the train arrives at a station. With passengers setting or standing in different orientation, it can be difficult to provide an easy to understand information as far as which side of the train the door will open. Canada Line trains do not have any interior door lights working in the same fashion as the our MK II cars. 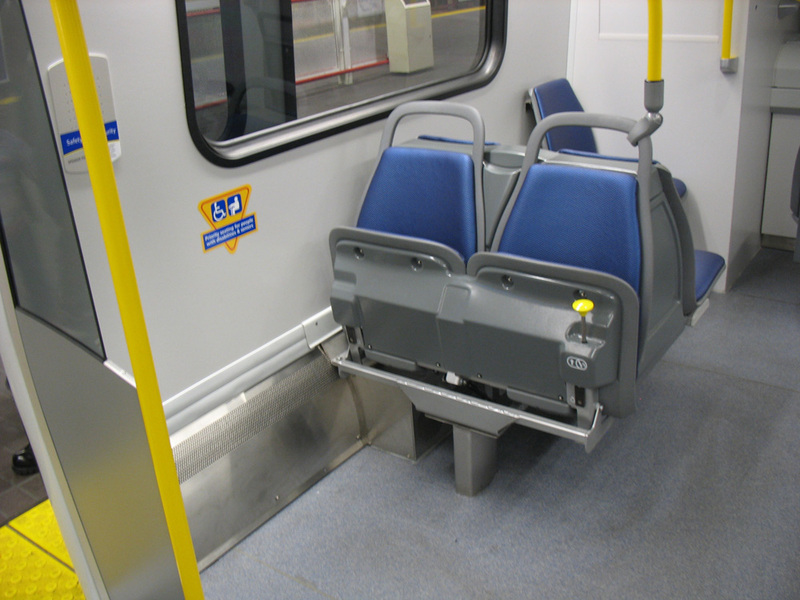 However Canada Line cars have an exterior door light above each door designed to assist the operating personnel in identifying, troubleshooting and correcting a problem door promptly in the event of a door fault. Therefore, with the help of the door lights the system delay due to door failure can be minimized and achieves superior customer service. The interior door light on our MK II car also serves the the same purpose as the Canada Line car exterior door light when it comes to dealing with a failed door. Philip: here’s the answer from SkyTrain for your second comment. Thanks for spotting the dicrepancy of timing between the door chimes and the door light flashing. We are in the process of initiating a software modification to make sure that the door closing status light will start to flash as soon as the door chimes is activated to alert the hearing impaired passengers to stay clear of the doorway. The LCD screen was considered less effective than the dynamic Route Map, which provides the necessary information to our passengers with respect to the next station stop, where the train is heading and the ultimate destination etc all at one glance. OK I’m on the 307 for the first time at Stadium. Forget the AC, I love the wide aisles with the single seats on the sides. People are blocking the doorway as much. Typo…. I was trying to say people are NOT blocking the doorway as much as they can move down the aisle. Instead of door chimes, why not play a recorded message along the lines of “Please stand clear of the closing doors”? I’ve heard this in a lot of other systems. It won’t cost that much, would it? I have one more suggestion to make. Along with the lit map (which is a great feature that’s long overdue), a recorded message telling the next station would be nice. When a train’s crowded, it’s a lot easier to hear a message than to try and squeeze close enough to the map to read it. Derek: there still is a recorded message announcing the next station, in addition to the map. Thanks Jhenifer, but I meant a recording telling the next station that’s played when the train is stopped at the previous station. as in “this is x station. the next station is y”.